That is what my former female boss said to my face when — after a year of having my confidence undermined by her — I resigned from my job at a Hollywood film studio. The pain of this still stings because I come from a long line of women in aprons; because women should champion each other, not threaten each other; and because no woman should tell another where or how she belongs. I’ve been reflecting a lot on how I healed from that experience. This moment in time is bringing forward two truths of healing, both of which touch the heart of what I now do as the CEO and filmmaker of my production company, Women Rising. The first: that the time for women truly championing each other is finally here. The second: that the power of community and the personal impact of belonging is essential to each of us. October 11th was International Day of the Girl. Since I founded Women Rising, this United Nations-founded holiday has represented almost an adopted anniversary for us, as it is driven by an intention that we share and feel deeply: “to help galvanize worldwide enthusiasm for goals to better girls’ lives, providing an opportunity for them to show leadership and reach their full potential.” On October 11th of this year, at an event in Austin, I was able to unite several of the girls whose voices I am currently championing — Delaney Colaio, Lizzie Velasquez, Tyah Amoy-Roberts, and Kelly Rogers — and celebrate their leadership and the extent to which they are delivering on their full potential. These girls — my girls — call me ‘Sara Poppins.’ Complete with an oversized carpetbag-style tote that carries all manner of emergency kit supplies and that could also pop out a floor lamp at any second, I build the stage for and direct the spotlight on one girl at a time as each finds and begins to use her voice. I have experienced first-hand the impact of bringing forward each female beacon who has represented, divinely, the idea that we can be what we can see. Bravery. Resilience. Acceptance. Purpose. My first story spotlight was on the incomparable Lizzie Velasquez. Making A BRAVE HEART proved to me the impact of the power of a voice. It proved to me that it’s not the size of the voice but the resonance and power of its vulnerability and the contagiousness of its courage. Our humble film about a seemingly small being with bravery big enough to fill stadiums has gone on to play around the world, with Lizzie’s message a true courage-contagion, changing and saving lives every day. ProtectHer, my second film, was a project aimed at redefining sexual assault prevention – empowering male athletes on campus to better protect the girls on campus, by using the grit and the candor that only ProtectHer Founder Alexis Jones can deliver. As a survivor myself, I was looking to bring in a young female story that the male collegiate athletes could connect with as a friend, a sister, a girlfriend. Delaney Colaio, 18, was ready to share her story of what happened to her one night in high school. Our on-camera interview was more of a joint healing. Because that’s what happens when two people come together who break down their own walls to build something even higher. The day after she shared her story, she wrote to me that she had “never felt more heard.” That same email shared with me that she was a member of another club, one she was enlisted in as a three-year-old: the club of 3,051 kids who lost a parent in 9/11. Fast-forward to a year and a half later. Our project together — currently in production — is WE GO HIGHER. Delaney is growing and finding herself and her voice before our camera’s eyes. Because Delaney raised her hand and offered up her story, more than 55 9/11 Kids have had their messages and insights to the world filmed. And because she raised her hand, this summer in New York we united the survivors and surviving loved ones from Sandy Hook, Manchester, Las Vegas, Orlando, and Parkland for the first time to create a global community around resilience and hope ahead. They want the world to know that no matter what happens to you, no matter how dark the light may get, you can light a candle with your hope and the knowledge that you are never alone. 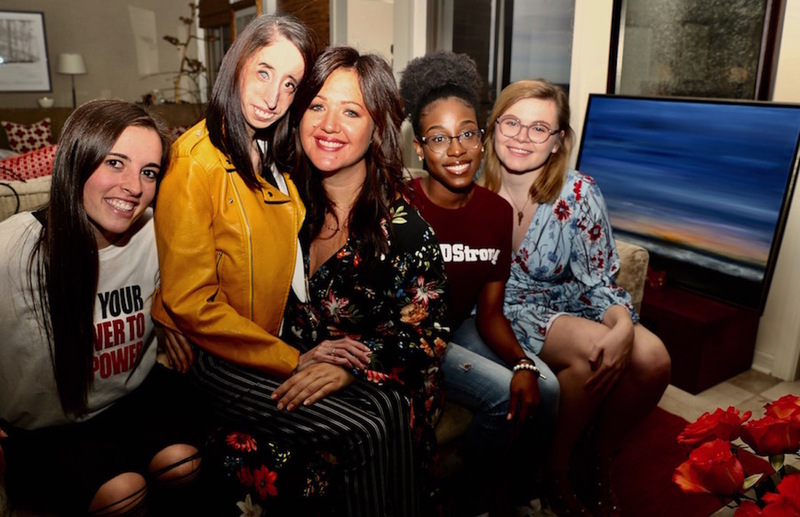 Last week, I was able to unite several of our heroes for the first time in Austin to celebrate the Day of the Girl and help fundraise as we look to finish WE GO HIGHER. As I look at this photo of my adopted daughters, I know so richly what a real female hero looks like. She looks like Delaney who still fights each day for hopeful moments for herself and her community. She looks like Lizzie who braves each day with a sense of self that overthrows any negativity that the world might bring. She looks like Tyah who is a high school student ignited by a tragedy that she uses as empowerment for herself and for students around the world. She looks like Kelly who at 18 produced a march that would contribute to changing the world. These young women aren’t here to compete. They are here to unite and to thrive. Sometimes we have to survive a breakdown so that we can truly break through. When my female boss, who began as one of my own heroes, told me that I didn’t belong, something inside of me wasn’t destroyed – it was born. It inspired me to find my purpose. For me to direct light on each of them is that purpose, and the purpose of our work at Women Rising. To elevate them as a new kind of collective community of young female warriors and to support them as they begin to directing light on EACH OTHER — supporting each other as they walk forward for issues larger than themselves — is a gift. The space and time that they belong in is right here and right now, and the thing that belongs to them is the light. Their light. A light they’ll share with all of us, if we let them. Check out a first-look teaser and learn more about WE GO HIGHER, go to www.wegohigherfilm.com. This essay was featured in the Oct. 21st edition of The Sunday Paper, Maria Shriver’s free weekly newsletter for people with passion and purpose. To get inspiring and informative content like this piece delivered straight to your inbox each Sunday morning, click here to subscribe.